Parking Your Thoughts has to do with the power of the spoken word, the unspoken word and the thoughts we hold tight. Where do you park? I’m not referring to your car, I am referring to your thoughts. What thought or thoughts does your mind rest on most often? The spoken word has enormous impact on us, especially when accompanied by honest emotion. The words we think and say hold a depth of power few understand though thankfully, the subject is becoming more and more popular. The subject of, and discussion about where we park our thoughts however, is relatively uncharted territory. In mediation we are encouraged to allow our mind to be still. Initially this can be daunting. Finding and holding this space, or actually living in this space is challenging. I’m a huge believer in adding light to our lives. Staying mindful of what we are feeling, thinking, and saying helps us do just that, as does meditation. But meditative state aside…when we rest, where do we park our thoughts at the end of the day or at the end of a conversation? After the words have been spoken, where does the mind go? Think about the last time you “spaced out” during a walk and found yourself blocks away from your intended destination. Do you remember where your mind went? Unconsciously parking your thoughts is when you find yourself replaying a scenario over and over again in your head. You keep the emotion behind the memory alive in a suspended freeze or you hold onto the feeling the event evokes, and you park there. The mind does go somewhere when it roams and I believe that remaining conscious of where it goes is as important as the words we speak and the thoughts we think. I find it encouraging to know that once we learn how and where to park our thoughts, we gain access to a new level of contentment that feels really delicious. I refer to it as a purposeful neutral. But we need to stay conscious of where we allow our mind to wonder. Consciously parking our thoughts in a safe environment contributes to our ability to manifest the fabulous. So, I have a question for you and it is not a commoner one? Where do you park your thoughts? Do you rest them on feelings of love, hope, hopelessness, daring, or of course, fear? Do you know? Find a parking spot…Ask yourself these three questions when you are alone and have a few moments to yourself. You now have more conscious control over where you rest your thoughts. This is where affirmations can be a beautiful thing. Choose an affirmation, quote, or poem that feels good to read and rest your thoughts there. 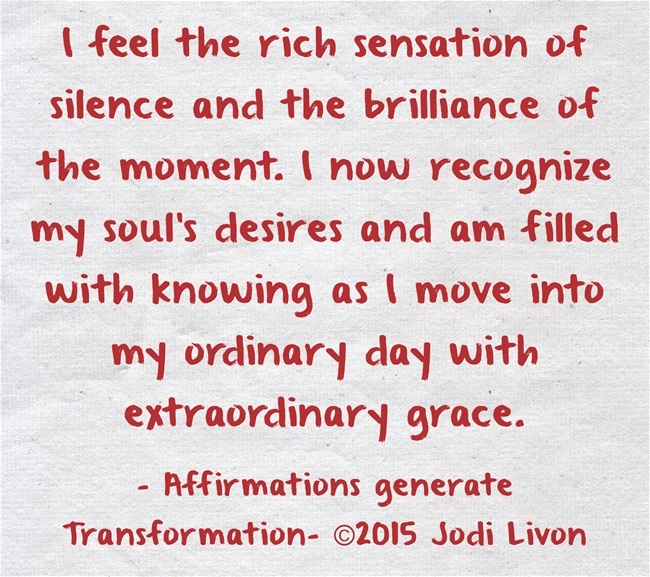 Allow the sensations you feel as you read the affirmation to move in and through you. Memorize the feelings. Here is an example. 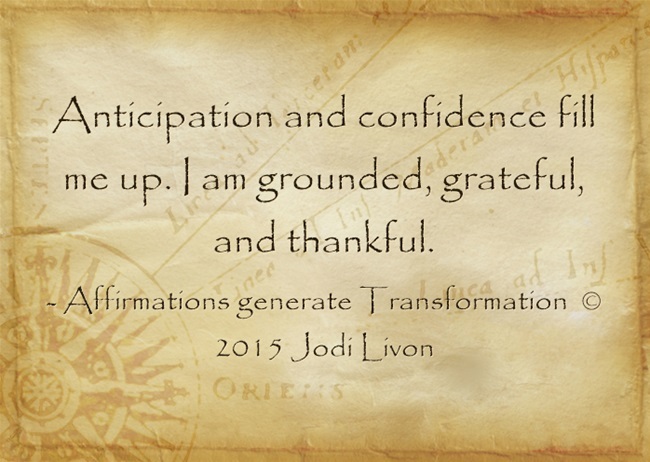 If you are feeling excited and anxious over upcoming changes in your life, read something like this affirmation and hold onto the feeling reading it evokes. This is what I mean when I say,… Park your thoughts HERE! Remember…When we know how and where to graciously rest our thoughts, and choose to do so, we gain access to a new level of contentment. If you found this enjoyable, sign up for my free awareness building tools & receive humorous intuition building games, techniques & exercises! Click Here to learn more! 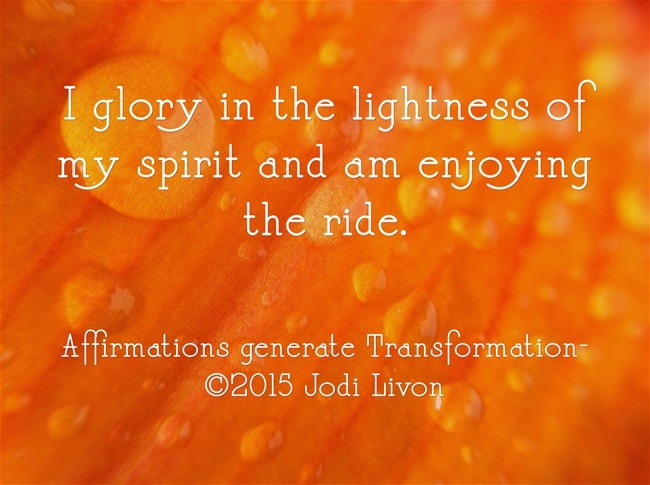 Hope you enjoy my affirmations, thank you for reading my blog! 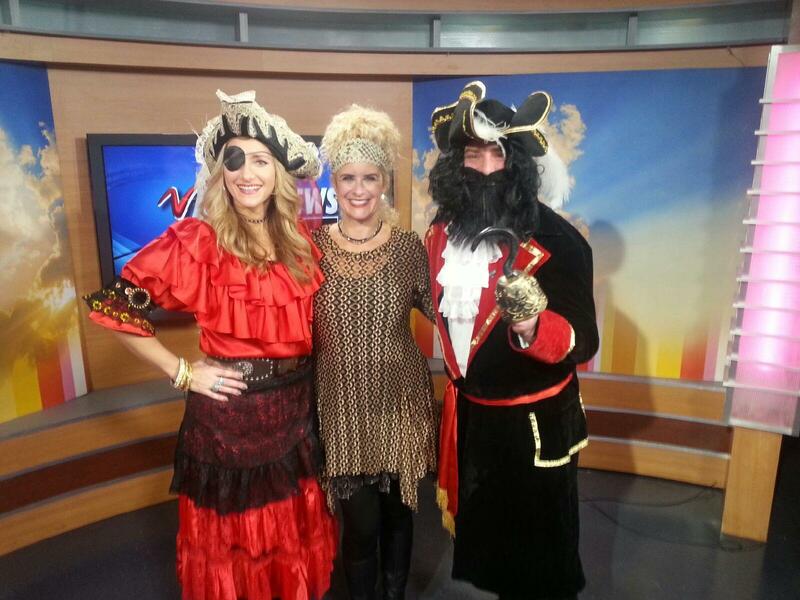 Did you see Jodi’s last TV segment on Twin Cities Live? She read Paul McGuire Grimes, TCL’s Movie Guy! He’s a riot and the reading was great! Feel like sharpening you own intuitive skills..or finding out how sharp they just may be? Sign up for Jodi’s FREE awareness building tools & receive humorous intuition building games, techniques & exercises! Click Here to learn more! Does Change Make You Itch? When I sense that some form of change is in the air..or that I am ready for change, I notice that I have become a little bored with the status quo and/or that something that has always worked substantially for me in the past suddenly isn’t any longer. On some metaphysical level, I itch. There are also times of course, when I wish to revamp an area in my life because I feel I’ve grown..and am ready to bring something fresh and new into my life. 1. Am I running from something or someone such as an unwanted emotional reaction to a feeling or a person? If you are, work toward resolve on that end or anything you create will be tinged with the vibe of avoidance. Try listening. Simply sitting with the feelings and allowing them to tell you their story offers amazing benefits toward that end. 2. Am I willing to change? Am I okay with letting go of old, worn out thoughts and views about myself and other people? 3. Am I truly open to embracing whatever shift occurs knowing that things tend to morph into what I need most in the end? Clean something. Clean a drawer, a purse or wallet, a room, or your pet’s cage. Remove the discarded items from your home. The physical action shows the Universe you are not only ready, you are in fact, taking action. Adding affirmations to the mix of mind, heart and body employs intuition. Intuition, as I often say, is a partner in the creative force that helps us magnetize that which we most desire. 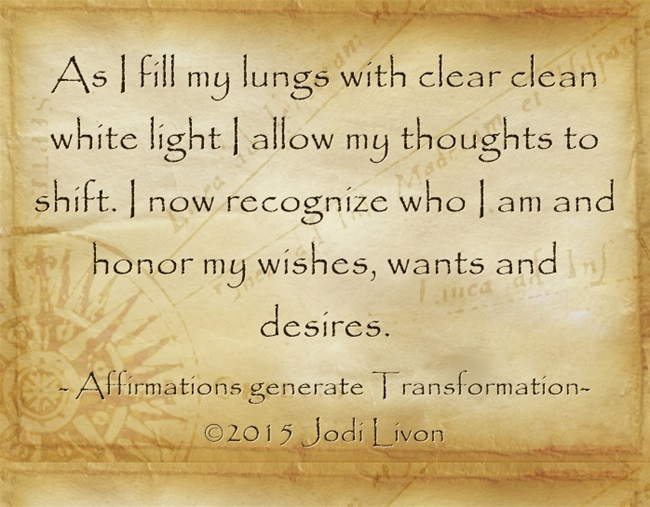 Affirmations, also a partner in the creative force, are an instrument of transformation. An affirmation is a proclamation, a declaration of change! Find at least six affirmations that feel good to read. In the last few months, I have filled my blogs with affirmations so please feel free to use any I’ve written. Check out books stores and the internet for more affirmations and/or write your own. Statements that begin with I can and I am, and I have are tremendous because they put us smack dab in the present! A powerful affirmation is written in the present tense and is always positive. It rewires the thinking process and effectively neutralizes old, worn-out messages that play repetitiously in our mind. These few simple steps can alter energy and change our vibe. Remember, our vibe, or vibrational frequency denotes how our own energy interacts with the Universe and everyone and everything in it. When we are higher in frequency, we are higher in consciousness. The two go hand in hand and the combination is perfect for manifesting the fabulous. Here’s a little exercise designed to help You..enlighten You! 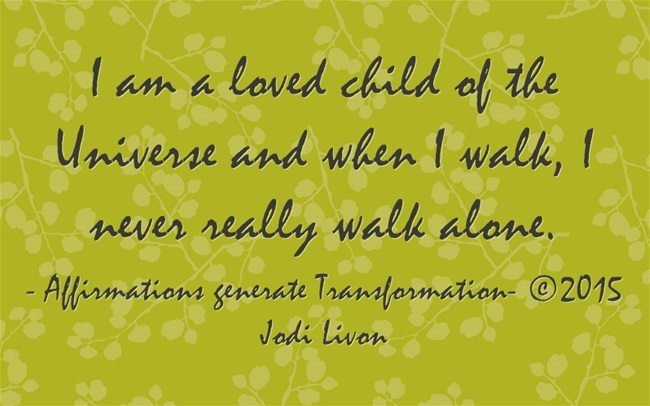 Take a walk through these affirmations and let your spirit soar. 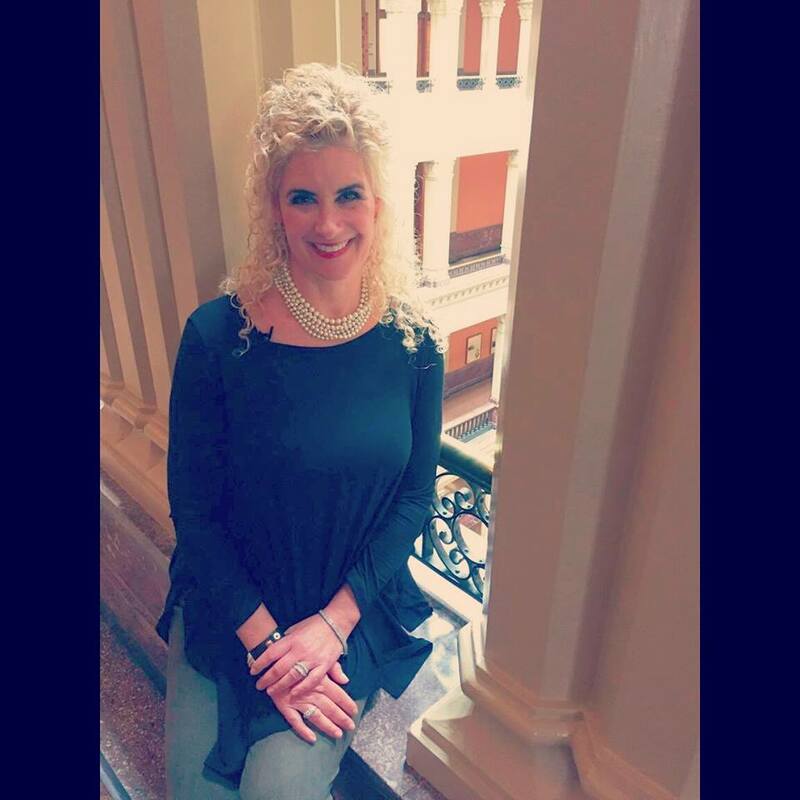 Jodi is on Twin Cities Live this Friday, November 20th, 2015! Numbers and symbols and signs are in our lives for a reason. They help illuminate the messages our higher soul-selves crave. Guides, angels, hunches and hugs do the same. People also love to ask me about signs from the other side..what they are and how they can know for certain that they are real? Though our loved ones are obviously gone from our everyday lives, they really are not lost. They are safe. Signs from the other side are abundant in form. The spirits sending them aspire to communicate a message or simply be acknowledged. There are so many, one blog could not possibly cover it but I’ll highlight some big ones! I do write more about signs of signs in The Happy Medium, (Llewellyn, 2009) if you would like to learn more. Another sign is a favorite song played repeatedly on the radio, especially on an anniversary date or a birthday. Music is an especially compelling way to connect. Some spirits use coins to say hello. They may be found repeatedly in odd places as a calling card. It is not uncommon to try so hard to see, feel or sense some sort of sign from a loved one on the other side that you actually miss them..or rather over look them. Just remember…there simply is no such thing as a coincidence. Be mindful of your dreams. Spirits on the other side like to reach us through our dreams.You do not have to try too hard to notice a calling card from a crossed-over loved one; just remain open minded and pragmatic at the same time. Signs from the other side are not the only signs to consider. Insightful messages arrive in many forms. Numbers are amazing tools of communication from our higher self and our guides as well as the Universal Source. Numerology is the study of numbers, and the mystical manner in which they reflect certain character tendencies. Numbers in sequence hold an amplified power. Seeing numbers in double, triple or quadruple form intensifies their qualities. When we see them over and over again, it also illustrates that we are in sync with the Universe. My understanding is that the number one is said to be the number of action, originality and creation..the number that started it all. Two is associated with cooperation and harmony and three is associated with the vibration of creative self-expression, manifestation and abundance for instance. My initial interest in numerology began years ago with the study of the Kabbalah. Though I love learning about numbers, I am by no means yet an expert. If you want more information about numbers, their vibration and meaning, there are a multitude of fun and interesting sources. Here are just few. IND5, Forever Conscious, Kari Samuels. So when we randomly look at the clock and see 11:11 over and over, the number one is amplified. The meaning behind the double numbers from the perspective of this medium, rests in part on what exactly we were doing right before the double numbers appeared. Many believe, myself included, that when we continuously see 11:11 it is a sign that we are waking up, spiritually speaking, to the divine light within and are becoming more and more aligned with our soul’s purpose. In other words, we are sparkling! When great numbers of people are noticing the same numbers at the same time, a planetary arousal or activation is underway. There’s a lot of talk about the new moon today…on11-11 and for good reason! Eleven is a master number and holds a high vibration. It’s a time of inspirational awakening! The light, including our light is amplified! Our ability to manifest our hearts desires will be far stronger than usual on 11/11 at 11:11pm! It is the start of a new energetic phase. We need to trust our deepest instincts and act on them. It’s time to master our life.This moon supports our dreams and desires! 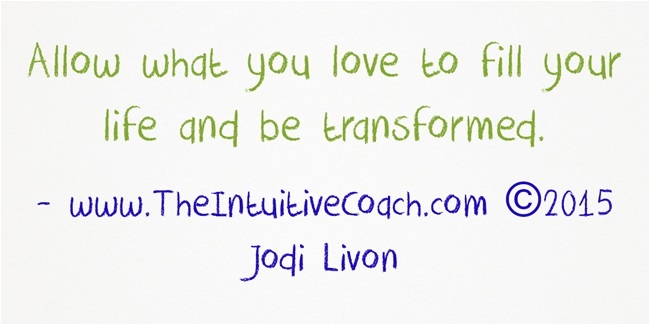 Interested in growing your own intuition? Sign up for Jodi’s FREE awareness building tools & & receive humorous intuition building games, techniques & exercises! Click Here to learn more! Sign up to be on our mailing list! Click Here to sign up! Jodi was recently on North Dakota Today. Click Here to watch her segment! Allow your response to the words on this page to flow through you. Walk through your judgment and hesitation, both colleagues of fear. Walk through the brilliance of hope and calm and feel contentment and courage begin to rise from within. Walk into what it feels like to be dauntless and to believe. Feel the brilliance of the moment and allow it to walk softly through you, and stay. Interested in growing your own intuition? 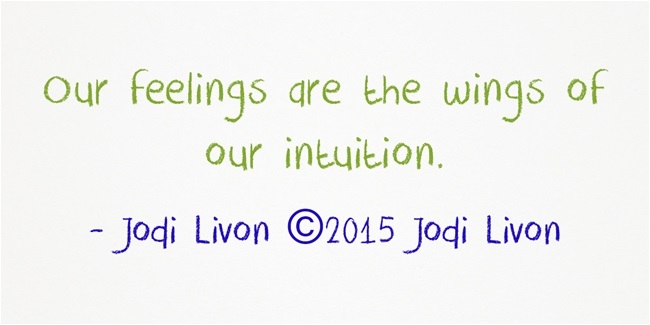 Sign up for Jodi’s awareness building tools & & receive FREE intuition building games & exercises! Click Here to sign up and receive a tool, technique, game or exercise! 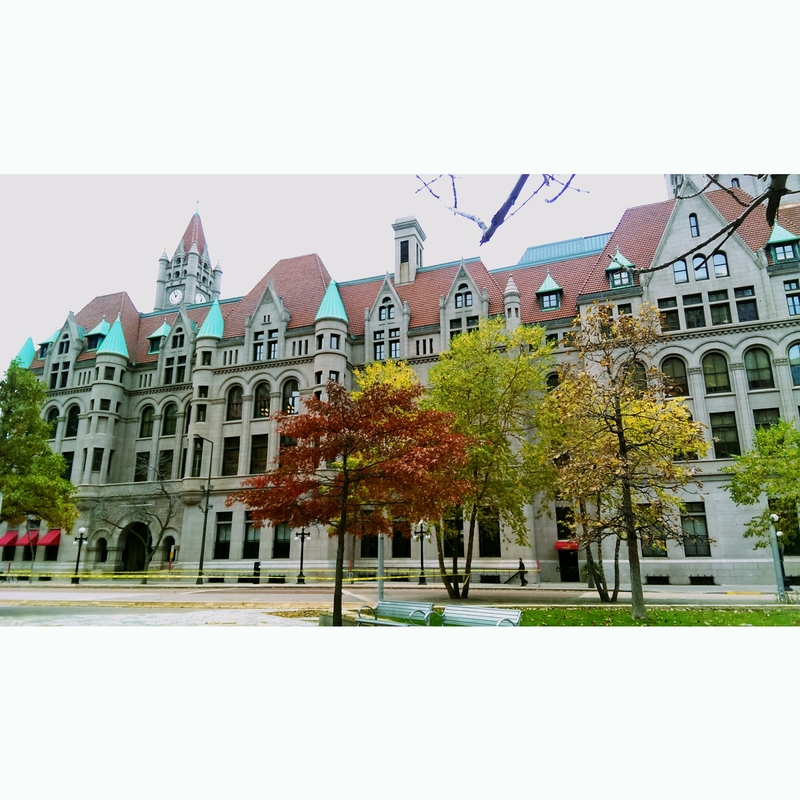 View Jodi’s ghost investigation with Twin Cities Live of Landmark Center in St. Paul! Jodi was on North Dakota Today last Friday, October 30th, 2015! Jodi has a great speaking engagement coming up on November 5th and tickets are still available! Come laugh, learn, and perhaps connect with a new part of yourself or a lost loved one…who, as it turns out is not lost after all! Click Here to learn more!